Does Your Law Enforcement or Emergency Response Job Expose You to Hearing Loss? Your job is to help and protect the community in which you live but does your Law Enforcement or Emergency Response job expose you to Hearing Loss? Are you the one who needs help and protection? 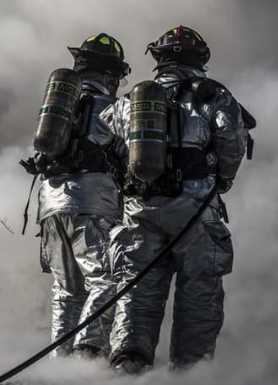 If you are in Law Enforcement, First Response teams of Police, Fire Fighting or Ambulance are you exposed to high levels of noise that can cause hearing damage? What steps can you and your governing authorities take to ensure your hearing is protected from on-the-job damaging sounds, sirens and high decibel sounds from weapons related devices? For more than a decade Firefighters have been filing lawsuits against an Illinois-based company that makes sirens. The claims have centered around the concerns that the company that makes sirens did not do enough to design the fire trucks in a way that would shield the Fire Fighters from sound blasts that reach 120 dB. Noise in the range of 120 dB would be equivalent to the noise from a jackhammer about 3 feet away and can cause pain and according to both OSHA (Occupational Safety and Health Administration) & NIOSH (The National Institute for Occupational Safety and Health) that level is outside of any time length of exposure for hearing safety. In other words, it is at a daily permissible noise level of 0 minutes! What about Law Enforcement, Military, Security or Correctional Officer jobs? Not only are you exposed to noise from the sudden discharge of weapons related devices but you could also be exposed to noise from Helicopters, sirens from emergency support vehicles and equipment. A jet engine at 100 feet can emit 140dB of noise, a Military Jet Aircraft take-off from an aircraft carrier with afterburner at 50 feet can create 150dB of noise, a 12 Gauge Shotgun blast at close quarters can be as high as 165dB! Most Governmental Workers exposed to noise are supplied HPD’s for use on the job. The importance of HPD’s is that they are the correct style of protection for the environment you will be in. You will need a different hearing protection device for the firing range where the focus will be on as much protection from noise as possible with less need for being able to hear commands or instructions. While on-the-job as a Law Enforcement Official in a situation where there is a strong possibility of weapons being fired, you would require a HPD that is instantly attenuated for gun fire but allows for certain necessary sounds to be heard such as interpersonal and radio communications or equipment. Are you exposed to these high levels of noise on the job? Are you supplied and correctly using a personal hearing protection device that provides you the correct protection throughout your day? Have you been properly trained in its effective use? Be aware of what the warning signs of hearing loss are. Understand that tinnitus or ringing in the ears may not be the sound of your background environment but may actually be the beginning signs temporary leading to permanent of hearing loss. Hearing loss due to damage is not reversible and in fact may lead to further damage as your loss of hearing may be causing you to turn up the volume of TV’s, music devices or phones. Recognize that hearing loss may also take the form of selective hearing loss of certain frequencies of sound. You may not hear high pitched sounds of a female or child’s voice but still be able to clearly hear the low pitched sound of a man speaking. Take caution in your job and protect not only the public in your service oriented career but also take care to protect yourself and your valuable asset of hearing. Learn more..